Hello, learners! Greetings from Makerdemy. 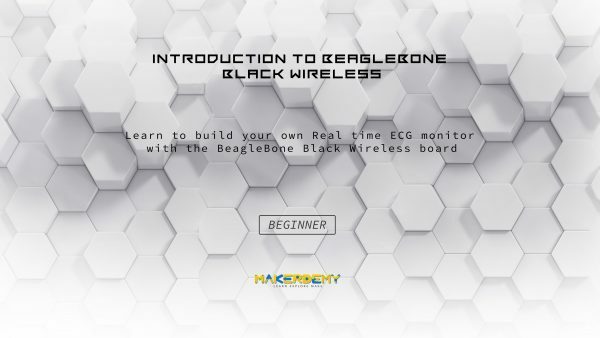 In this course, you will learn how to program to Build your own Real time ECG monitor with a BeagleBone Black Wireless board using ECG AD8232 Sensor and beebotte IoT plaform. In this course is for anyone who is interested in exploring the newly released BeagleBoneBlack Wireless. This course is for anyone who is interested in learning about fundamentals of BeagleBone Black. This course is ideal for those who are interested in exploring the possibilities of BeagleBone. The course does not require any prior knowledge of BeagleBone and Python Programming language. I will teach you to hook up the Beagle with a keyboard and monitor and use it as a fully functional desktop. I will also teach you how to configure the BeagleBoneBlack board, and you can use it wirelessly. You will learn how to interact with the hardware and build complete BeagleBoneBlack projects using Python programming language. The course consists series of lessons will show you how to get up and running on the Beaglebone Black Wireless. An advantage of the Beaglebone Black over the Raspberry Pi is that it has Analog input capability, which the Pi does not. The Beaglebone has a much smaller and less active user community, so it is harder to find examples and information for this platform. So, I will put together a series of lessons that will show you how to use this board in your projects. Our basic approach will be to do programs and control the GPIO pins using Python. Project 1: In this project, we will teach you how to blink LED from the GPIO pins using Python. Project 2: In this project, we teach you how to make the connection to control the brightness of LED using the PWM command in Python. Project 3: This project will explain to you how to read the state of push buttons using Python. We will be using an external pull down resistor, and will be using digital reads. Project 4: In this project will learn how to read analog values using the Analog In pins on the Beaglebone Black Wireless. Project 5: In this project, we will teach you how to precisely control the position of a servo using PWM in Python. Project 6: In this project, we will teach you to basics for getting your AD8232 Heart Rate Monitor up and running. I will also cover real-time medical project in this course; I will go over the basics for getting your (AD8232) Heart Rate Monitor up and running. Then, I’ll show you how to hook it up to BeagleBone Black Wireless and to create a real-time visualization of ECG data Using Beebotte IoT platform. I will teach you how to step into the world of Internet of Things and remotely visualize the data on the web. You will also learn how to integrate web application API with BeagleBoneBlack Wireless and emotely save the Real-time ECG data on the web server. I will guide you step by step how to go about building this project. I will also share the source code with you so that you can replicate the project by yourself. At the end of the course, you’ll be fully familiarized with BeagleBone Black Wireless and ready to build your own application micro-controller projects. I look forward to you joining this course. It provides the complete source code of the real time project.